Marcus Pfister enlists his famous fish in two concept books. 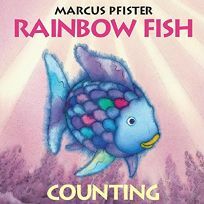 Numbers in Rainbow Fish Counting progress from one crab to 10 fish, but, as the last page reminds readers, there is ""only one glittering Rainbow Fish!"" In Rainbow Fish Colors, sea creatures from a ""purple octopus"" to a ""grey dolphin"" teach basic hues.